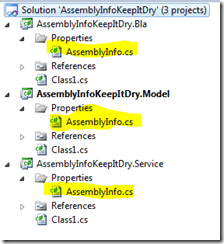 Code Inside Blog | HowTo: AssemblyInfos – Keep it DRY! HowTo: AssemblyInfos – Keep it DRY! What's written in such an Assemblyinfo file? Depending if you are a product- or a project-firm you have different needs. I only work with projects and except the title, description and guid it's the same thing anyway because I deliver everything at once and don't want to make magic stuff with the DLL. So what can I do? Solution! 1. 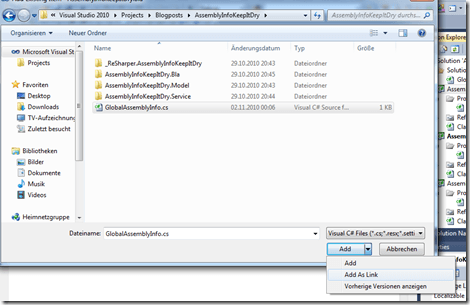 Create a "GlobalAssemblyInfo" file: click right on the solution and create a new item. Now we have just one location for our file. This could be very useful if you want to, for example, administrate the version-number. 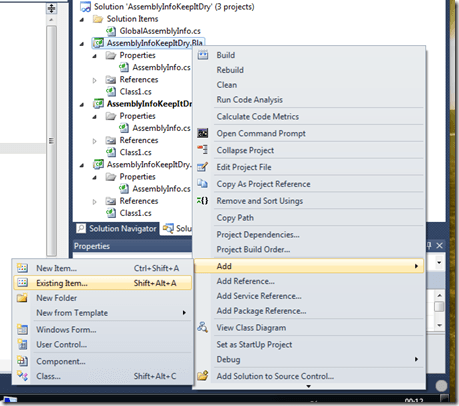 You are able to change the number at one location and every DLL will be created with the same. Easy but effective.